This is long, long overdue! But I'm trying to keep up with the blog a lot more lately. You should always support your friends, so I'm here to support one of mine on his new business venture. 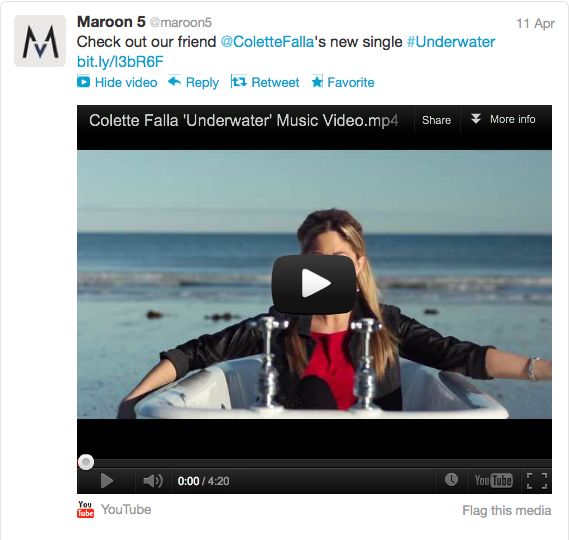 Colette Falla is my friend Jerren's roommate, and she currently released her debut single called "Underwater." I love British singers and the single has a retro sound which is very similar to the likes of Adele, Duffy, and even Amy Winehouse, given, like Colette, they're all British and all have a vintage vibe. One word I'd use to describe it is sultry. "Underwater" was co-written with Jerren and Johan Carlsson from Carolina Liar. She's gaining a lot of steam over in the UK with "Underwater," and currently the single is out on iTunes. Take a listen and if you like, spread the word here in the US! She's currently on a promo tour and she'll be in Austin this upcoming weekend performing. 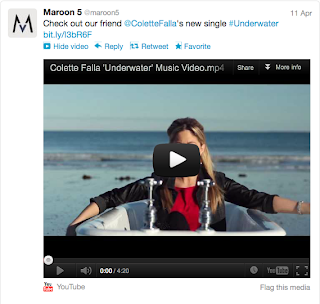 Maroon 5 even gave a little signal of approval by tweeting the video. I'm really excited to hear one of her other songs that's been getting some buzz -- there's a lot of people in the industry who are anticipating a full album, and my friend Taryn said there's a song about a hangover that has a fun Katy Perry vibe. Which, really, who doesn't like a good hangover song? If you want to hear it, support her music so she can get her songs out there!